Video Baby monitors are highly sought after security gadgets because they let parents know the well-being of their baby. We have reviewed the latest and the best video baby monitors. Check our list below. If you are one of those parents who are just obsessed with watching your new-born all the time, a video baby monitor will serve your purpose very well. With the busy lifestyle that people have now-a-days, it can get really difficult to take care of a baby. A video monitor helps you to keep a watch on your baby while you are working. It saves you the trouble of having to go to the baby’s room time and again to check on them. You can see your baby through the monitor and go to them only when they need something. An audio monitor does help you keep a check on your baby, but it can be deceptive sometimes. You certainly don’t want to keep running to your baby’s room at the slightest noise you hear, to check what is wrong. The video monitor gives you the comfort of being connected with your baby at all times. There are a number of video monitors available in the market. It can become really confusing sometimes, to pick out the best one. 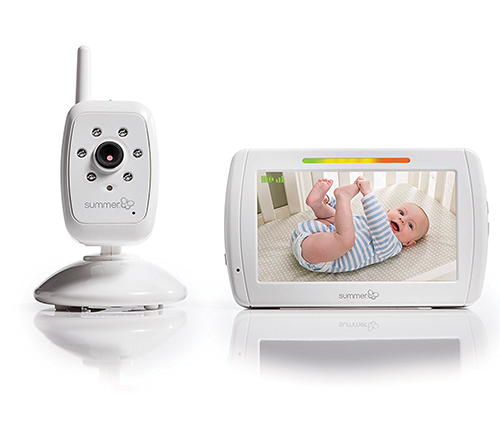 We have compiled here, a list of the 5 best video baby monitors. So, you can go through our definitive and well-researched list of the best video baby monitors and choose the one that perfectly suits your requirements as well as your budget.. Infant ﻿Optics DXR-8 Video Baby Monitor with Interchangeable Optical Lens is one of the best sellers among the baby video monitors. This is the first monitor that provides you the feature of interchangeable optical lens. It helps you to adjust the viewing angle as per your wish and also to zoom. The LCD display is 3.5 inches and gives you very clear colored images. It has a long battery life. The battery lasts 10 hours on power saving mode and six hours when the screen is on. It also has a sound activated LED display. This video monitor also has the temperature monitoring feature. This keeps you updated about the temperature in your baby’s room so that you know if your baby is comfortable, and can adjust the temperature accordingly. The two-way talk back system of this monitor helps you interact with your baby whenever you want. So, you don’t have to go running to your baby’s room at the slightest noise or sound you hear. Your baby will also feel at ease knowing that you are around. In the power saver mode, the screen turns off and only the audio mode remains on. This converts the video monitor into an audio monitor. It also reduces the battery consumption by about half. Another interesting feature is the option to toggle off the beeping warnings from the menu options. The beeping warning alerts for when the device went out of range or in the case of low battery, can be a little annoying at times. Now, you can easily turn it off as per your convenience. It has wide angle lens and additional zoom lens too for that clearest picture. It also includes a remote camera pan/ tilt. It is a little expensive, but the amazing features that it has make it truly worth the price. 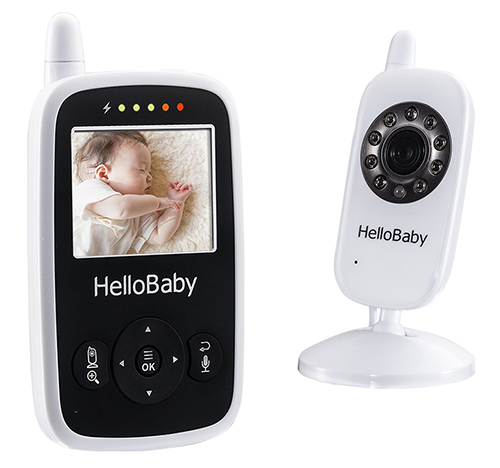 The Hello Baby Wireless Video Baby Monitor with Digital Camera HB24, Night Vision Temperature Monitoring & 2 Way Talkback System basically combines all the best features that you find in the other video monitors. The monitor gives great video and sound quality. The night vision feature in black and white is very clear as well. It uses the 2.4 GHZ wireless technology. This technology gives a great range of up to 960 feet without any barriers and also prevents any kind of signal dropouts, thereby ensuring a perfect transmission. The baby camera is very simple to set up. You can just plug it and it starts playing. Another great feature of this video monitor is that a single parent unit can be paired with four baby unit monitors. So, if you have twins or more than one baby in your house, you don’t have to carry many monitors with you to keep a check on the children. It can all be done with just on parent unit. It has a large battery capacity. The battery lasts 12 hours in the power saving mode and 8 hours with the screen on. In the power saving mode, also called the VOX mode, the screen is off but the audio function is activated. So, in this mode, the monitor acts like an audio monitor and you can keep a check on your baby. The battery consumption reduces by almost half in the VOX mode. It also has the temperature monitoring feature to keep you updated with the temperature in your baby’s room. The two way talk back feature allows you to interact with your baby any time you want to. There is also the sound activated LED indicator, which helps you keep a check on your baby even while the device is muted. This is also helpful for someone who has a poor hearing. It has the optical pan and tilt feature. It comes with the option of two times digital zoom, which will give you a very clear picture of your baby. It has 8 alarm levels and also has lullabies you can play to comfort your baby. It provides crystal clear image without any pixelated textures. The battery is rechargeable. Packed with loads of features! The Summer Infant In View Digital Color Video Baby Monitor has a 5 inches LCD screen with colour display. It also has automatic black and white night vision. The range of this device is a good 600 feet. That is enough to let you work around the house, while still being connected to your baby. The technology used in this monitor is 100% digital and ensures a secure and private transmission. It also comes with the low battery and out of range indicators. This is really important to let you be sure that you are actually connected to your baby at all times. There is also a digital zoom feature, which lets you have a closer look at your baby. There are sound activated LED lights. 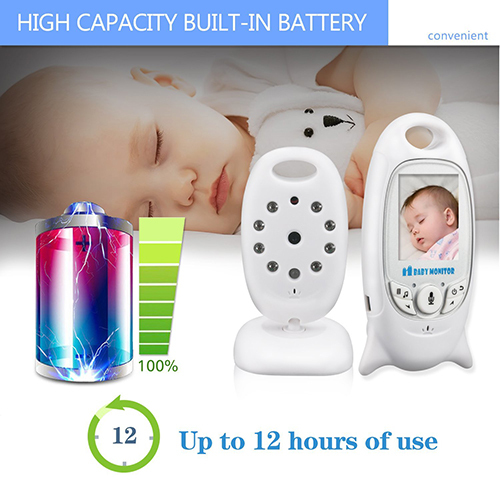 So, even if the device is on the power saving mode and the screen is off, it will function like an audio monitor and help you keep in touch with your baby. For this, you have the one touch, power saving, video on/ off option. The camera has a swivel design, which makes it very convenient to set up anywhere- on the table top, for wall mounting or for positioning over the baby. It is an expandable system. This means that you can add up to 4 extra cameras. It has adjustable brightness and volume controls. It also has the automatic power saving mode, which greatly reduces the battery usage. It comes with security clips and a wall anchor. The device is portable, so you can carry it along with you while working around the house. Priced right with good features! 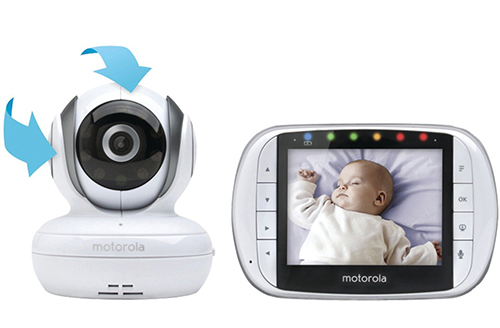 Motorola ﻿﻿video monitor comes with a 3.5 inches colour display LCD screen, which gives you a very clear view of you baby and your baby’s room. It has the remote pan and tilt option. You can also zoom in to get a closer view of your baby. It has the feature of two way communication. So, you can interact with and comfort your baby whenever you want without having to actually go to the baby’s room multiple times. You baby is also likely to be less cranky, knowing that you are around. The microphone of the device is highly sensitive, so you will be alerted of the slightest activity or noise from your baby’s room. It has the 2.4 GHz FHSS wireless technology which provides clear and secure transmission. It has infrared night vision. So, you can keep a check on your baby even at night when the lights are turned off. There is a room temperature monitor which helps you keep a check on the temperature in your baby’s room. There are 5 built-in lullabies, which you can use to comfort your baby, whenever they get cranky. It also has the multiple cameras viewing option. This feature is great if you have more than kid as it allows you to view different rooms simultaneously. You can view all the cameras together on a split screen, or you can use the timed auto- switch option from one room to another. There are alerts for low battery and when the device goes out of range and an alarm sounds to alert you about it. This ensures that you are in touch with your baby at all times. It has a large range of 590 feet. So, even if your house is large, you can still stay connected with your baby. The battery is rechargeable and lasts for about 3.5 hours. The last one on our list is the Hollyson Digital Security Baby Monitor Videos Camera with Night Vision Temperature Monitoring and 2 Way Talk Talkback System. The signal is completely secure and free of interference. As you can judge from the name, this video monitor comes with the feature of night vision as well. So, you can keep a check on your baby all night, whenever you sense the slightest problem. It has the temperature sensor, which helps you in knowing the temperature in the baby’s room. So, you will know if the temperature is uncomfortable for your baby and you can adjust it accordingly. The monitor also comes with the talkback feature. This allows you to interact with your baby and comfort them in case you can’t reach out to the baby’s room immediately. The transmission range of this monitor is 960 feet. So, regardless of where you are in the house, you can still stay connected to your baby through this video monitor. The monitor is also portable. So, you can carry it along with you while you are working around the house. It claims to have a long battery life as well and rechargeable batteries. It also comes with two power adapters with long cables. Another amazing feature of this video monitor is its 8 built-in lullabies. This helps you in comforting your baby and getting them to sleep, in case the baby is being cranky. That is certainly a great price for so many amazing features. Great features At Great Price! Choose theBest Video Baby Monitors. 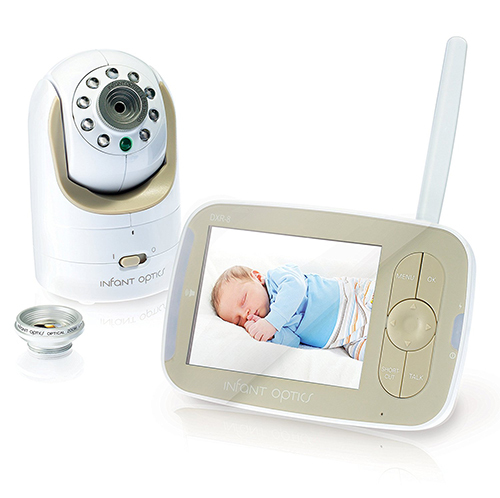 Our list includes affordable digital baby video monitors with 2 way, temperature sensors features.